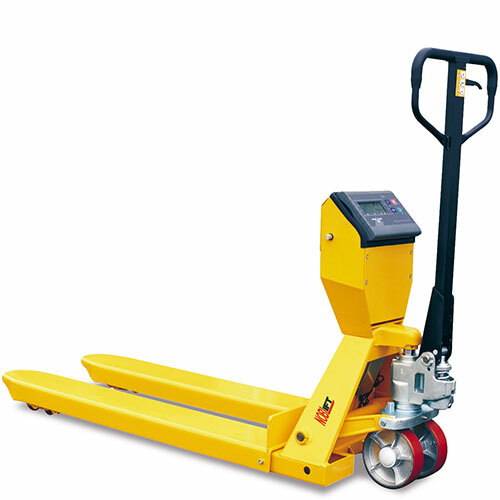 Available in two models—PTS568 and PTS703, these pallet trucks are equipped with scales, and have entry and exit rollers for easier operation and to protect the load roller and pallet from damage. This pallet truck is supplied with an accurate digital scale system, it does not have a thermal label printer attached. They also feature a totally sealed hydraulic pump with a slow lowering hand control valve, fully adjustable push rod under forks, three-position control handle, and grease fittings at key point. With a load capacity of up to 2000 kg, they are an ideal alternative for users who require pallet weight of goods for transportation purposes, and provide a smart pallet handling solution to ensure safe and efficient work. Entry and exit rollers for easier operation and to protect load roller and pallet. Totally sealed hydraulic pump with a slow lowering hand control valve. Full adjustable push rod under forks. Grease fittings at key point. Safe moving of heavy goods and pallets. Suitable for: warehouses, factories, manufacturing, food service industries, retail.